Or you can manually cut the white rocker card base by cutting a 5.5” circle and fold it in half. Then cut a 5.25" X 2.5" half circle for patterned paper layer. Prima flowers, pearls, leaves were cut out with EK Success punch, ribbon and twine. OMG, this is just TOO CUTE!!! You knocked it out of the park. Love the pretty lavender too. Another great card! I love this style and love the color purple! Thanks for stopping by and linking up in our Funday Friday challenge this week at Jo's Scrap Shack! Have a great day! 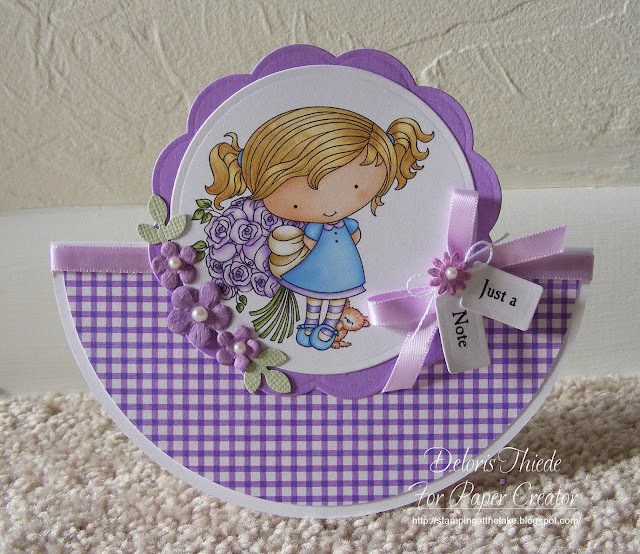 Another beautiful card Deloris, I love this colour combination. Such a delightful card! Glad I had the pleasure to stumble upon your blog! Awesome take on this week's challange! This is so adorable, I love the rocker design - so unusual! she is so sweet love the lilac tones you have used. Great rocker card. This must have been a time I was sick, out of town, or just plain busy. This is precious!